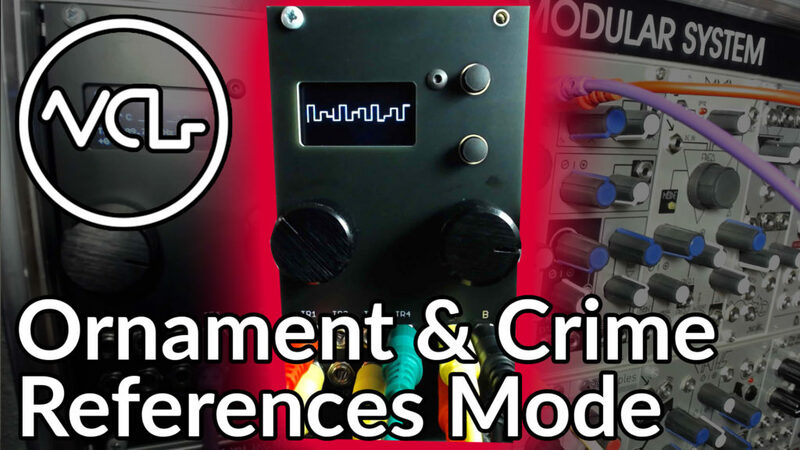 Ornament & Crime is a powerful tool, with many modes that are each worth exploring. We’ve been working with the module for quite some time, and some of our favorites include Piqued mode which can generate Euclidean Rhythms, Quantermain with four Turing Machines, Acid Curds for complex chord progressions and more. References mode, on the other hand, is a utility meant for analyzing the frequency or bpm of incoming signals. This utility functionality can be particularly useful for calibrating oscillators. While most oscillators are calibrated before they leave the manufacturer, they tend to eventually go out of tune. The result is an oscillator that does not properly track 1 volt per octave modulation, leaving intervals a bit flat or sharp. This can be especially problematic and noticeable when modulating by octave or volt, so the main use for References mode is to provide a platform for testing these intervals. With an oscillator patched to trigger input 4 and output D patched to the oscillator 1 volt per octave input, the module will send out a series of 1 volt offsets, starting at -3 volts, then -2, and increasing up to 6 volts. As it does, References will display the current frequency which should double each time the voltage increases by 1 volt. Any oscillators that do not respond in this fashion should be recalibrated, and you can use References to help in that process. The Mod Rate and Mod Range Oct settings in the options menu set the time and interval between which the module will alternate. Locate the trim pot on the back of your oscillator, and adjust it so the octave interval appears as close to a doubling of the base frequency as possible. If the frequency is 110, then one octave above should display 220. An octave above that, 440… above that, 880. Count is designed to act as a leading clock, the centerpiece tempo source for an entire modular system. The time section, which includes coarse and fine tuning frequency knobs, a slow or fast range switch and a CV input, can range from extremely slow clocks to aggressively fast. The resulting clock tempo is output from the main output at the bottom left corner of the module. Modulating the time can generate strange and unusual beat combinations, especially when paired with a step sequencer. The width section controls the pulse width of each clock pulse, from a constrained trigger at the far left, to the longer held gates as the control rises. This can also be modulated by CV to create interesting, changing patterns. The Count starts to look more unique as we descend down the panel to the four switches, starting with the start/stop switch. The switch simply starts or stops the clock, sending a gate from the start CV output directly beneath the switch. The start gate is handy as a restart function, making sure sequencers restart at the beginning of their patterns when the clock starts. How are you generating interesting clocks in your system? Tell us about it in the comments! We’ve launched our new Voltage Control Lab Memberships, based around monthly private lessons, weekly online group office hours, access to our growing, exclusive video library, discounts on VCL events and much more! Check it out at www.voltagecontrollab.com. Now on to the Quad Gate Delay!! Malekko has been churning out great modules over the past couple of years, thanks in part to the hard work and vision of module designer, Ben Davis. 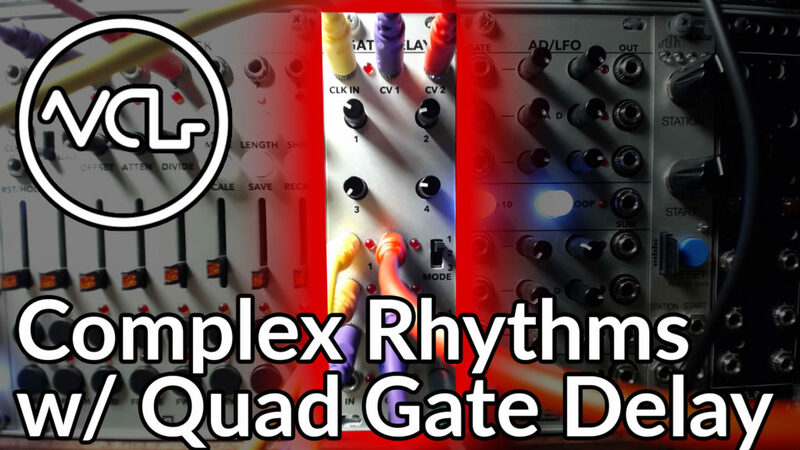 The newest device from the company is the Quad Gate Delay, a utility for introducing funky time shifting to gate patterns and rhythms. The Quad Gate Delay is not a delay-based audio effect. Rather, the module receives a gate input, passing that gate to the output after quite literally postponing the gate signal for a certain amount of time. In our first example, we pass the same clock information through two channels on the delay, and slowly increase the delay time on the second channel, creating an off-kilter rhythmic relationship between the two clocks. This can be used to generate shuffled beats and clocks. The Gate Delay features three channel modes and three time modes, with drastically different results with each. The channel modes alter how the 4 channels handle input gates. The first mode sets each channel to operate independently of the others, so we can route the different drum patterns in our groove to the channels in the delay, and then slightly alter the timing. This can be handy for funky beats, particularly for creating hiphop in the modular universe. The second mode sends any gate sent to channel 1 to the outputs of the other three channels, a setting that might be useful for creating ruffs, bursts or broken beats. The third mode sends any gate output from channel 1 to the input of the next channel, creating a cascading delayed effect down through the 4 delays. The time-based modes also determine the functionality of the gates. Mode one sets each channel to a millisecond based delay time, so that delays can be extremely short or free from any clock or tempo. Modes two and three require a clock input at the top of the panel, and base delay times around that tempo. Mode two is unquantized, while mode three is quantized to the beat, making it handy for rhythm remixing. The channels 1 and 2 delay times can also be modulated via the inputs at the top of the module, pairing well with the Voltage Block or other step sequencers. How are you mixing up your rhythm and gate sequences? Tell us about it in the comments! By now, we are probably all familiar with 2HP modular… The company has been rolling out dozens of modules since starting up only about a year ago after the success of the Qubit Eon, intent on providing a series of slim modules that will fill those annoying little gaps in your system. 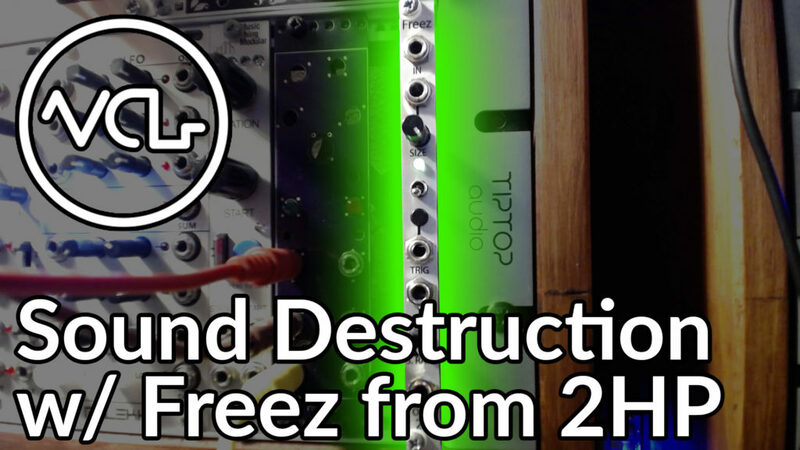 Stephen and the 2HP crew were kind enough to send along their recent slicing and glitch-friendly module, Freez, for a thorough examination. Freez is a fairly simple module in execution. An audio signal is fed to the input, a small chunk of which can be looped by engaging the Trig button on the panel, with either latching or normally off modes controlled by the switch above. This microloop can then be modulated in size and quality, to stretch and destroy the audio. The slice knob controls the speed and size of the loop. When a slice has been captured, the Slice knob tends to act like tape, turning the knob counterclockwise will speed up the looped sample and also raise the pitch. Freez also features control over the sample rate of the sliced audio. As the sample rate is lowered (when the knob is turned counterclockwise) the sample lowers in audio quality while decreasing in pitch. Both the Slice and Sample Rate controls on the panel combine to determine the length and quality of the overall slice, from 9 milliseconds to 3 seconds, with sample rates from a low 2.36 khz to higher quality 96khz. The sample rate function built into Freez is always active, even when a sample is not captured. This means the module can serve as a distortion effect when it’s not slicing and chopping. Modulation really kicks Freez into overdrive. LFO modulation can generate classic microloop glitches and sweeps, sometimes giving the impression of time stretching. Stepped modulation is also very handy, allowing the sequencing or randomization of our parameters in time with a beat. Of course, engaging slicing can also be modulated using gate sequences. How are you chopping, slicing and glitching your beats and synths? Tell us about it in the comments! Check out our new Voltage Control Lab Membership Program! You get a private lesson, weekly office hours, access to our growing video library and tons of other stuff when you sign up! More info in the Lab!!! Moffenzeef have been on a roll in 2017, developing some exciting and performance friendly modules including their newest clock dividing beast, MITO. They were kind enough to send one along for inspection and experimentation, and it is extremely fun and flexible. Named for the cell division process Mitosis, the device includes 6 independently controllable clock dividers, capable of reducing the incoming clock down to 1 pulse every 16 clock pulses. Each clock can be set using the appropriate channel knob, or muted using the corresponding on/off switch. The six channels can be individually modulated via external CV signal as well, to create intricate and changing patterns. 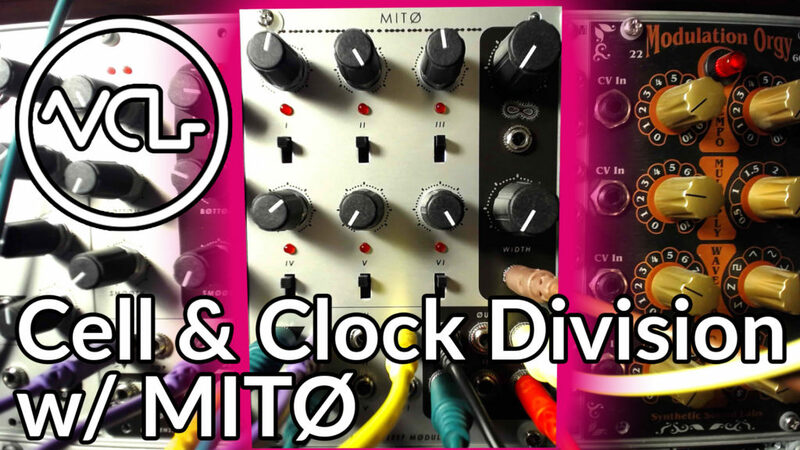 Paired with a sequencer or another Moffenzeef module, The Deviant, that can alter the division amount in a repeatable way, MITO can generate complex rhythm loops. MITO also features control over swing amount of every other incoming clock pulse using the Amoeba knob and CV input. The swing function delays every other 16th note pulse, and can shift from off to subtle swing all the way to shifting every other pulse to overlap the next pulse. Light modulation of the swing amount can vary yield a more live rhythmic feel, while heavy modulation can be destructive and jarring (in a good way!) Pulsewidth is another modulation friendly parameter, allowing the note length to be altered. This is another function that greatly benefits from modulation, especially when used with envelopes and percussion modules with gate inputs. Along with all of the other Moffenzeef digital modules, MITO is based on arduino architecture, allowing the user to hack and alter the internal code to suit their own needs. The appropriate materials are available for download from the Moffenzeef Github page, and available under a CC-BY-NC-SA Open Source license. 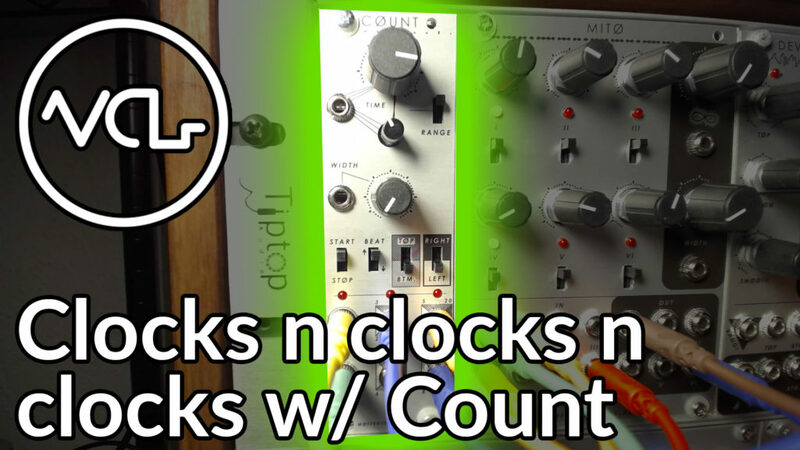 That means if all of those uneven clock divisions are not really cutting the mustard for you, you can find the code and edit some small portions of it to get even clock divisions from the outputs… Or maybe just from the top three! How are you generating complex and interesting patterns in your system? Tell us about it in the comments!